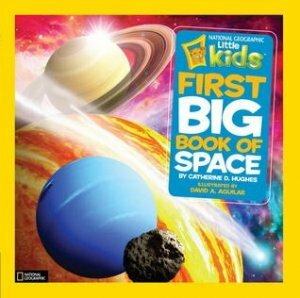 Space holds such fascination for so many of our young readers and listeners. This book is full of the basic information they are searching for to get a picture of where our planet is in the solar system and the universe, what else is around us and what sort of missions have we sent out to explore the great beyond. Diagrams and photos give great visual images of where Earth sits in the row of planets along with the Kuiper Belt, the asteroid belt, and other non-planet spheres that lie at the edge of our neck of the woods. Does Neptune's largest moon have volcanic eruptions? What are stars made of? What's a black hole? Could we live on Mars? What does the Hubble Space Telescope do? Five separate chapters cover "Looking Up From Earth," "Earth's Neighborhood," "Earth's Other Neighbors," "Far, Far Away," and "Exploring Space." This is not text heavy. Its power comes from the essential facts and the captivating images it shares. Includes a glossary and an index and parent tips.